Miami City Ballet will add five major works to its repertoire this season, included a highly anticipated world premiere by Alexei Ratmansky, as well as revivals of several other works. All repertory programs will be danced to a live symphonic ensemble, the Opus One Orchestra, led by Gary Sheldon. To launch the season, MCB will reach back to the 19th century and present its greatest romantic ballet, Giselle. The story of an innocent peasant girl turned mad by her lover’s betrayal is one of the most cherished ballets of all time. The coveted title role, which requires both outstanding acting skills and impeccable technique, is a part that every ballerina longs to dance. Giselle will be performed in Program One on Nov. 11-13 at the Kravis Center in West Palm Beach. Program Two (Kravis, Jan. 20-22) will highlight dance of the 20th century, with three company premieres alongside one of MCB’s signature works. The program will begin with the sleek Calcium Light Night which was the very first ballet that Peter Martins choreographed. Created in 1978, it is said that it was the initial motivation in George Balanchine’s decision to choose Martins to be his successor at the New York City Ballet. It is an edgy, contemporary work for two dancers who — in a series of solos and duets to eight short challenging scores by Charles Ives, one of America’s greatest composers — engage each other in both combative and seductive interplay. MCB will expand its Jerome Robbins repertory by presenting Glass Pieces, which is set to a thrilling score by Philip Glass. Tightly structured with clean images of urban America, it is a work that resonates with audiences. When Robbins premiered Glass Pieces in 1983 (with Artistic Director Lourdes Lopez in the original cast), The New York Times hailed it as “a picture of our times — the electronic age, the computer age.” With a large cast of up to 42 dancers, it is a tour de force work that combines movement, lights, set and costumes with the hypnotic quality of the music. Another new work on the program will be Carousel Pas de Deux by Sir Kenneth MacMillan, a major choreographer whose work is new to MCB. It is a poignant duet that was adapted from Carousel, the 1945 musical by Richard Rodgers and Oscar Hammerstein II. MacMillan was renowned in the ballet world for his mastery in creating outstanding duets, so it was no surprise — when the show traveled to Lincoln Center in 1994 — that MacMillan was posthumously awarded a Tony Award for his choreography. In this portrayal of the love between the young central couple, he captured both the ecstasy and danger in their relationship. Program Two will also include Serenade, one of Balanchine’s most famous and venerated works. Choreographed in 1934, it was the first ballet that Balanchine made in America. Through a multitude of beautiful formations in which the all-female corps de ballet flows across the stage in loose hair and pale blue skirts to Tchaikovsky’s Serenade for Strings, the work gently suggests some kind of transformation. Plotless but with a lasting impression, Serenade is always beautiful to re-experience. In Program Three (Feb. 24-26), MCB will take us into the 21st century with a world premiere by one of the most important choreographic voices working today, Alexei Ratmansky. In his second commission with MCB, Ratmansky bases his work, The Fairy’s Kiss, on the Hans Christian Andersen tale of The Ice-Maiden. Set to a Tchaikovsky-inspired score by Igor Stravinsky (which Balanchine so loved that he set three ballets to it), Ratmansky will utilize a large cast, striking visual effects and costumes to create a new narrative ballet for MCB. Symphonic Dances, which he choreographed for the company in 2013, was very well-received. Also on the program is a new Balanchine acquisition, Walpurgisnacht Ballet, which is set to music from Charles Gounod’s Faust. There is not a hint of Faust in the work which features a bravura ballerina role and a corps of 24 alluring women — a favorite Balanchine formula. Tailor-made in 1980 for his famous muse Suzanne Farrell, the lead must be impetuous and virtuosic showing both complete abandon and sheer control at the same time. Christopher Wheeldon’s contemporary Polyphonia will return for an encore after its popular reception in 2013. In 10 classically constructed but very contemporary episodes, four couples separately but intensely explore Wheeldon’s geometric movement to the compelling piano music of the Hungarian composer Györgi Ligeti. Choreographed in 2001, Polyphonia sealed Wheeldon’s reputation as a major choreographer and it is now performed by companies around the world. On Program Four, the season’s finale, MCB will present Arden Court, one of Paul Taylor’s best-loved works, alongside two Balanchine masterpieces: Who Cares?, set to the music of George Gershwin, and Divertimento No. 15, set to the music of Mozart. Balanchine choreographed his work to Mozart’s Divertimento No. 15 in B-flat (K. 287), which he called “the finest divertimento ever written.” A plotless ballet is danced in five movements that highlight five women in distinctly individual solo variations and a series of duets danced with three men. The baroque-influenced Arden Court, set to the music of English composer William Boyce, will return to the MCB stage after 11 years. Balanchine’s Who Cares?, created in 1970, is set to familiar Gershwin songs such as “I Got Rhythm,” “Embraceable You,” “The Man I Love,” “Fascinatin’ Rhythm,” and over a dozen more. Program Four will be at the Kravis Center March 17-19. Tickets for all MCB performances start at $20 and are available at miamicityballet.org or by calling the MCB Box Office at 305-929-7010 or 877-929-7010 toll-free. And it wouldn’t be the Christmas season without MCB’s production of Tchaikovsky’s The Nutrcacker, as memorably staged by Balanchine. This beloved tradition throughout South Florida returns to the Kravis Dec. 28-30 with three evening performances and two matinees. MCB offers a VIP package that includes premium seating for the production, a commemorative program book with dancer signatures and exclusive photo opportunities with the Miami City Ballet dancers. For more information go to www.miamicityballet.org/nutcracker. 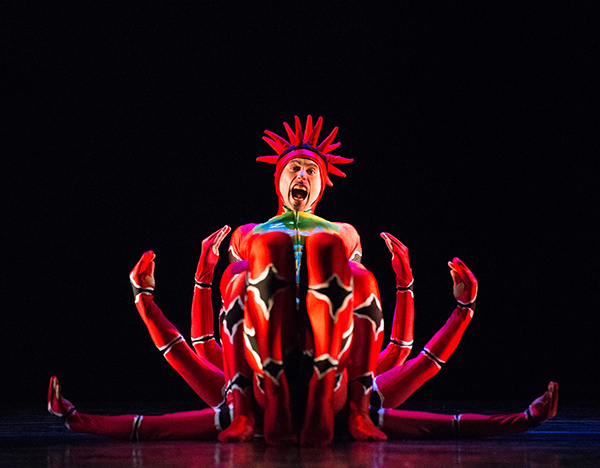 A scene from Momix’s Opus Cactus. For those that love modern dance, the always popular Modern Dance Series returns for another season at the Duncan Theatre. Located on the campus of Palm Beach State College in Lake Worth, the series will feature Philadanco, Malpaso Dance Company, BodyTraffic and Momix. Philadanco (Jan. 13-14), the Philadelphia Dance Company, is respected for its creativity and unique innovation as well as its preservation of predominantly African-American traditions in dance. Since it was founded in 1970, Philadanco has prided itself in breaking barriers and building bridges across cultural divides. Malpaso Dance Company (Feb. 3-4) which is based in Havana, Cuba, is committed to bringing Cuban contemporary dance into the 21st century by nurturing the new voices in Cuban choreography as well as collaborating with top international choreographers. The company is led by resident repertory choreographer Osnel Delgado. BodyTraffic was at the Duncan two years ago showing its high-quality work and will return Feb. 17-18. This fresh and savvy company is helping establish Los Angeles as a major center for contemporary dance. BodyTraffic was named among the “25 to Watch in 2013” by Dance Magazine and “the company of the future” by The Joyce Theater Foundation. Also returning to South Florida is the wonderful Momix, bringing its company of dancers/illusionists in a supremely Momix-ian show, Opus Cactus (March 24-25). Director Moses Pendleton brings the landscape of the American Southwest to life in his revival of this popular illusionistic work, which is filled with inventive and dynamic images of cactuses, darting lizards and fire dancers. Tickets for the Modern Dance Series at the Duncan may be purchased in person, by calling the box office at (561) 868-3309 or by purchasing tickets online at www.duncantheatre.org. The box office is open Monday-Friday 10 a.m.–5 p.m. All tickets for individual shows are $45 and tickets for the full season series are $135 and $145. Co-presenting with the Duncan Theatre, The Dancer’s Space: Create.DANCE.Florida will offer two special performances (Nov. 19 and April 8) filled with local artists performing inspiring and thought-provoking modern dance works. The two different shows will feature dancers from Miami City Ballet, Ballet Palm Beach, New World School of the Arts, Demetrius Klein Dance Company, BAK Middle School of the Arts, and The Dancers’ Space, to name a few. All tickets are $25 and $45 for both shows. The Harid Conservatory has announced its 2016–17 performance season, which will include classical, contemporary and character dance. Two series of performances will be presented this year. The Winter Performances (Dec. 17-18) will feature the Divertissements from Act II of The Nutcracker along with several shorter works, and the Spring Performances (May 26-28) will showcase the internationally recognized professional-training school’s graduating class in a mixed program of classical and contemporary ballets. All performances are held at the Countess de Hoernle Theatre at Spanish River High School in Boca Raton. Tickets are available online at www.harid.edu/performances; by telephone at 561-998-8038; or in person at Harid’s ticket office, located at 2285 Potomac Road, Boca Raton 33431 (weekdays, 9 a.m.–1 p.m.). Co-Artistic Directors Jane Tyree and Dan Guin will launch Boca Ballet Theatre’s upcoming season with their 25th annual luncheon and performance, “A Princely Affair,” on Oct. 23 at the Boca Raton Resort and Club. 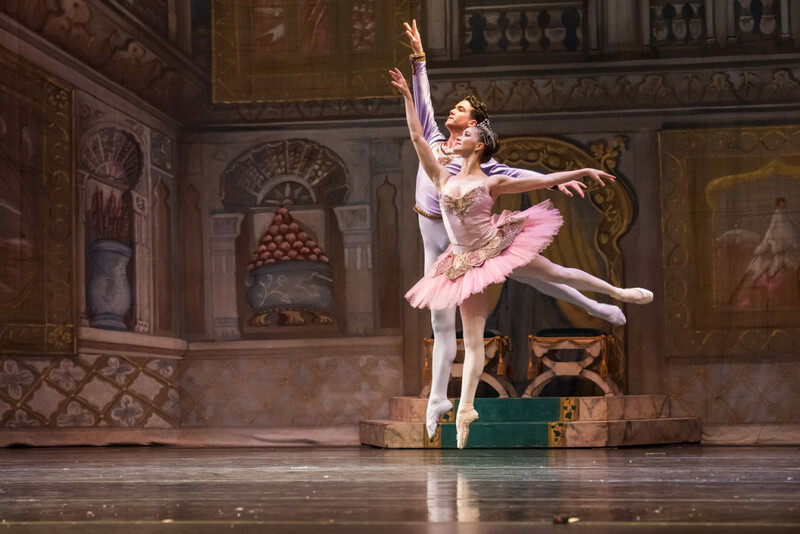 The following month, the company presents its holiday production of The Nutcracker with a cast of more than 100 dancers that will feature American Ballet Theatre guest artists soloist Cassandra Trenary and Gray Davis in the lead roles of the Sugar Plum Fairy and her Cavalier. The Nov. 25- 27 performances will be at the Olympic Heights Performing Arts Theater, 20101 Lyons Road, in Boca Raton. Next, BBT will perform La Sylphide, which is one of the loveliest of the story ballets. Performed in two acts, this full-length ballet ushered in the most beautiful and romantic era of ballet and it remains popular to this day. The April 8-9 performances will be at the Countess de Hoernle Theatre. BBT’s season will end with Brilliant Summer, which is a mixed repertory concert that will explore the different genres of dance in a blend of classical and contemporary pieces. The August 5-6 performances will be at the Countess de Hoernle Theatre. Tickets for all performances are available by calling (561) 995-0709 or by going online at www.bocaballet.org. They are priced at $20-$35 for adults and $10-$25 for children and seniors. Ballet Palm Beach will perform four programs this season at the Eissey Campus Theatre at Palm Beach State College in Palm Beach Gardens. It will begin with a mixed bill program on Oct. 22-23 that will include a fantastical adaption of the Grimm fairy tale Snow White as well a new work by contemporary choreographer Roger Van Fleteren. A highlight on the program will be Balanchine’s high-spirited Tchaikovsky Pas De Deux. It is a feather in Artistic Director Colleen Smith’s cap that The Balanchine Trust granted Ballet Palm Beach approval to perform this important work. On Thanksgiving weekend, BPB will usher in the holiday season by performing its annual production of The Nutcracker and on Valentine’s Day weekend, BPB will present the most famous love story of all, Romeo and Juliet, with Sergei Prokofiev’s score. The opening show will be a special family matinee presenting an abridged version of the full-length ballet. The season will close on Mother’s Day weekend when the company will present a reimagined and whimsical one-act version of Sleeping Beauty together with audience favorites from their repertoire. Tickets begin at $19 and can be purchased online at www.balletpalmbeach.org. PEAK, the Kravis Center series that presents groundbreaking artists from around the world, will include three dance events in its collection of diverse offerings. Now in its fifth season at the Kravis’s Rinker Playhouse, PEAK will present Balé Folclórico da Bahia (Feb. 3-4), Stuart Pimsler Dance & Theatre (April 7-8) and Reggie Wilson/Fist and Heel Performance Group (May 5-6). There are two other Kravis dance events that you may not want to miss that are for one night only: Twyla Tharp’s anniversary tour and Alvin Ailey American Dance Theater. Tharp choreographed Twyla Tharp: 50th Anniversary Tour, a program of new works that premiered in 2015, to take on the road and celebrate her five decades of dance-making. Tickets for the show on Feb. 17 start at $20. Alvin Ailey American Dance Theater will return Feb. 28 to the Kravis with a program of contemporary works that will finish with Ailey’s signature masterpiece, Revelations. Tickets start at $29. Reach Dance Company opens its 2017 season with the premiere of The Golden Age of Hollywood. Choreographer and Artistic Director Maria Konrad breaks away from her modern jazz and contemporary dance roots and dedicates her new work to “the voices of Judy, Marilyn and Bing, and the feet of Cyd, Gene, Fred, and Ginger.” This theatrical walk down memory lane honoring the legacy of these Hollywood legends will share the program with Trek, her newest modern jazz work. During these performances, Reach Dance Company will be sharing the stage with some of the students from Florida’s top universities who are participating in Florida Dance Festival’s College Dance Workshop. This diverse evening of dance will be held Feb. 11-12 at the Eissey Campus Theatre at Palm Beach State College in Palm Beach Gardens. Tickets are available online at www.reachdancecompany.com or at the door.